(Adapted from my book Foundations of Atlantis:​) Charles Hapgood in Maps of the Ancient Sea Kings, Zecharia Sitchin in When Time Began​, and Graham Hancock in Fingerprints of the Gods assert that Oronteus Finaeus’s New and Complete Description of the Whole World map, which depicts a wildly exaggerated and semi-mythical southern continent, was made from pre-Ice Age maps drawn by a lost civilization. None read the map’s legend, given below, which asserts that the map is entirely new and not reliant on older maps. 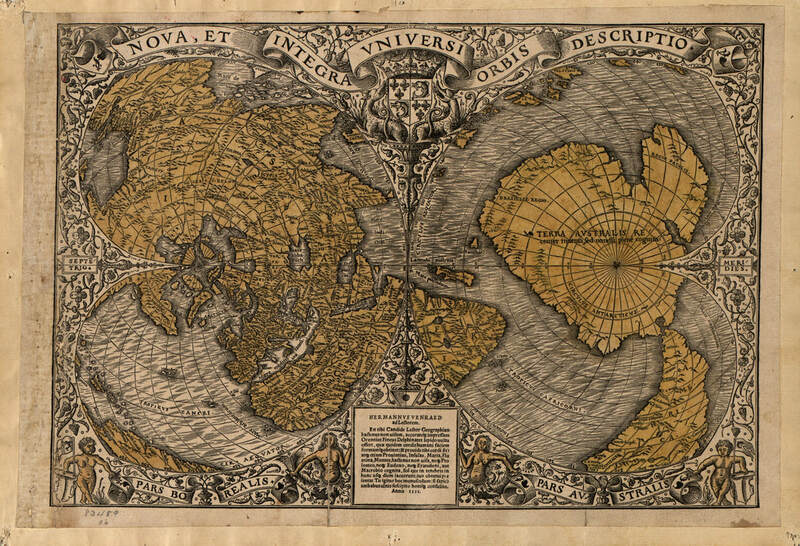 The unknown lands he describes and labels Terra Australis on a landmass superficially similar to Antarctica were meant to be Tierra del Fuego, discovered only in 1520. The Southern Land recently discovered but not yet completely known. Behold! For you, dear Reader, Oronteus Finaeus Delphinus offers an elegantly produced and accurately printed Geography, never before seen, which has the shape of the human heart (at least it should appear to you as a heart from a distance), and he presents for your gaze provinces, islands, seas, rivers, and mountains unseen before now, known neither to Ptolemy, nor Eudoxus, nor Eratosthenes, or Macrobius, but which have lain in shadows up to the present day. Therefore, please accept (if you have sense) this small present with both arms, and consult it usefully.